Learn How To Make Mango Mastani Recipe | Mango Milkshake With Ice Cream Recipe with a simple video tutorial. 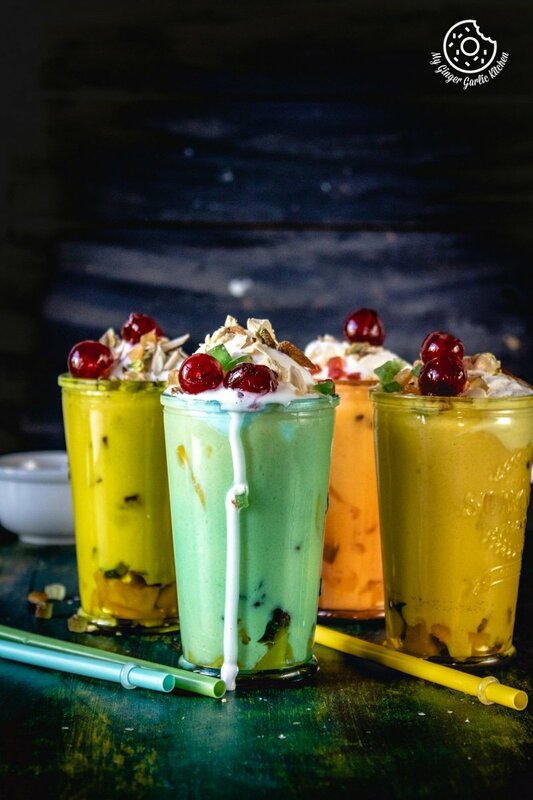 Mango Mastani is a rich and thick mango milkshake topped with vanilla ice cream, chopped nuts, and tutti frutti or Sweet Candied Fruit. This is a fabulously decadent & gorgeous mango milkshake, which is named after the famous Bajirao’s Mastani. 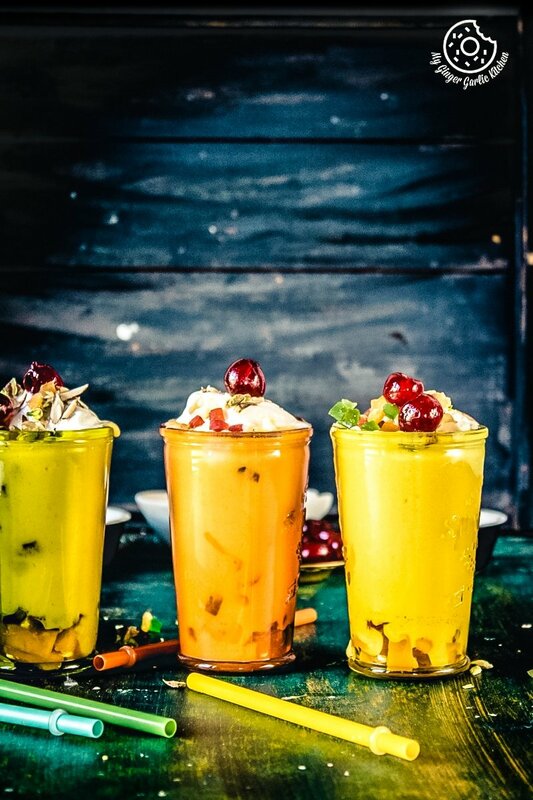 Mango Mastani is a very thick, rich and creamy dessert milkshake. It is a blend of mango puree with milk, vanilla ice cream, and some dry fruits. This milkshake has an intense flavor of mangoes. 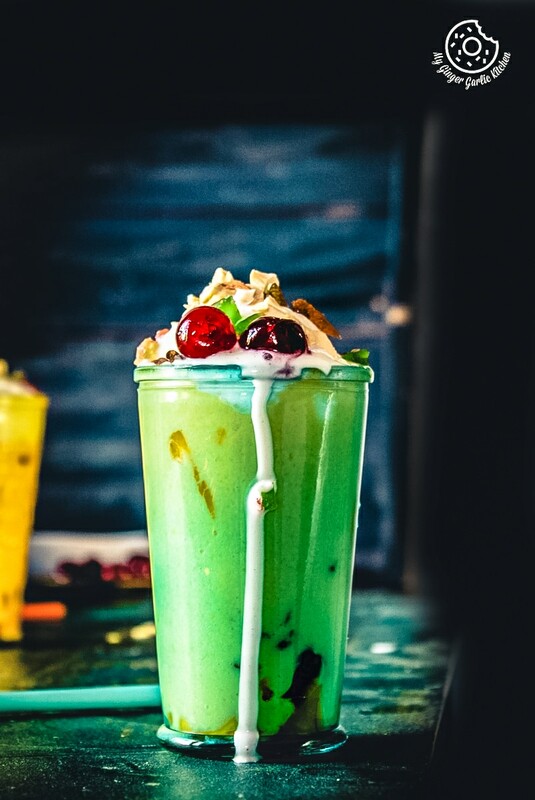 This drink is then dressed up with more ice cream, chopped nuts, tutti frutti and glazed cherries. What is the origin of Mango Mastani? Mastani is a very popular drink which originated in the city of Pune, in the Indian state of Maharashtra. You can say that a lavish glass of Mango Mastani (मैंगो मस्तानी ) is Pune’s very unique innovation. 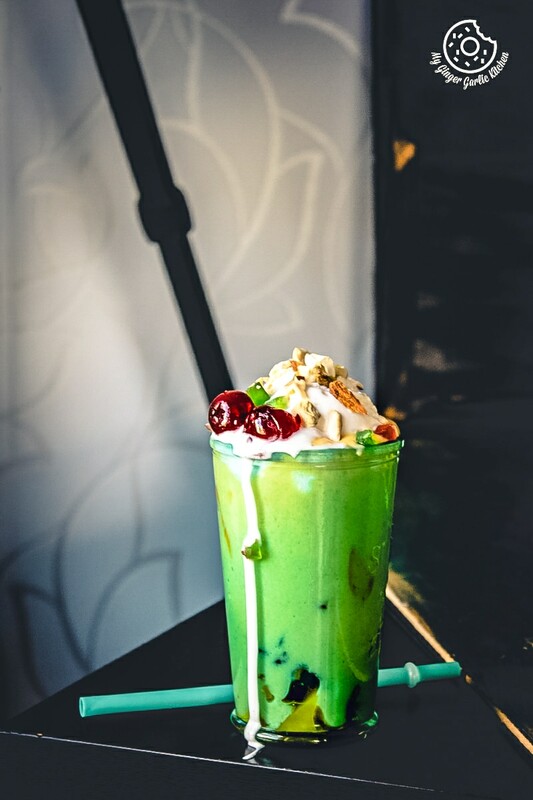 It is believed that this drink is named after Queen Mastani who was the wife of Peshwa Bajirao. Bajirao was a legend Peshwa ruler, and his beautiful lover and the second wife was called Mastani. This drink is also so close to every Punekars heart because this drink is inherent to their cultural heritage. If you love Indian culture and want to know more about it, then there is also a very beautiful Bollywood film made on this legendary love story. The movie’s name is Bajirao Mastani. What is the right time to make Mango Mastani? Well, there is no wrong time to drink Mango Mastani. Every time is a good time. But the fresh mangoes are only available during summer. And to cherish the mango season, you can make this stunning drink using the most marvelous mangoes available at such times. This gorgeously cooling drink is pure bliss for the blazing Indian Summer. If you love mangoes like anything, then you would definitely adore this beauty on a hot summer day. How difficult is it to make Mango Mastani at home? Very easy. The person who is making this drink only needs the ingredients and the knowledge of the process of blending. Try it once and you will be in awe of the simplicity and effortlessness of making this delightful mango milkshake which has a rich intense mango flavor. Is it a drink or dessert? Mango Mastani is an ultimate refreshing drink, but I should rather say that it is a very rich and satisfying dessert. Mango Mastani is mango lovers pure delight. Where to have Mango Mastani when visiting Pune? I have some friends from Pune, they say you can get mango mastani in Pune everywhere. 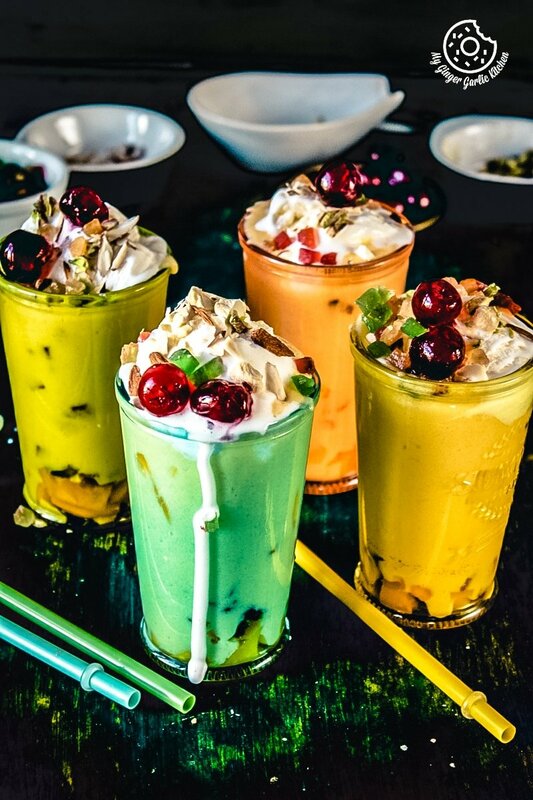 But if you want to enjoy the pure authentic Mastani drink, then you should visit Sujata Mastani which is located in Sadashiv Peth in Pune or Gujjar Cold Drink which is in the old Budhwar Peth in Pune. What else can you make with Indian mangoes? If you talk about mangoes, then I’d say that the Indian mangoes are solely the best. I guess that’s the primary reason that Mango is India’s national fruit. Apart from eating them as fruit, there are many humble delicacies made with this rich and luscious summer delight, such as, Mango Lassi, Mango Shrikhand, Mango Kulfi, Mango Ice Cream, Strawberry Mango Mojito, Mango Yogurt, Spinach Mango Tomato Pizza, Blueberry Mango Froyo Marble Bars, Coconut Mango Panna Cotta, Strawberry Mango Smoothie. Mango season is still here. In India, Mango season is almost gone, but in Nordics, I could still see the traces of juicy sweet mangoes. The enticing perfume coming from the sweet mangoes is hard to resist. They surely fill the store with their ripen and sweet aroma. Is sprucing up necessary for mango mastani? I would say yes. First, because mastani tastes so good with these toppings. Second, the presentation is the key. 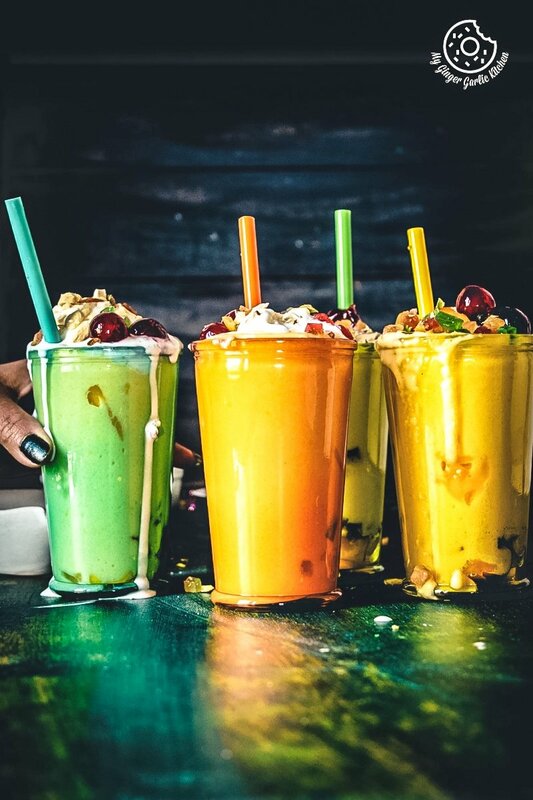 This milkshake is all about prettifying the mango milkshake with different textures and colors. So the topping of colorful tutti frutti, glazed cherries, and chopped nuts make Mango Mastani more divine and desirable. It’s indeed a delicious summer treat for all mango lovers! Why would you love this mango mastani? 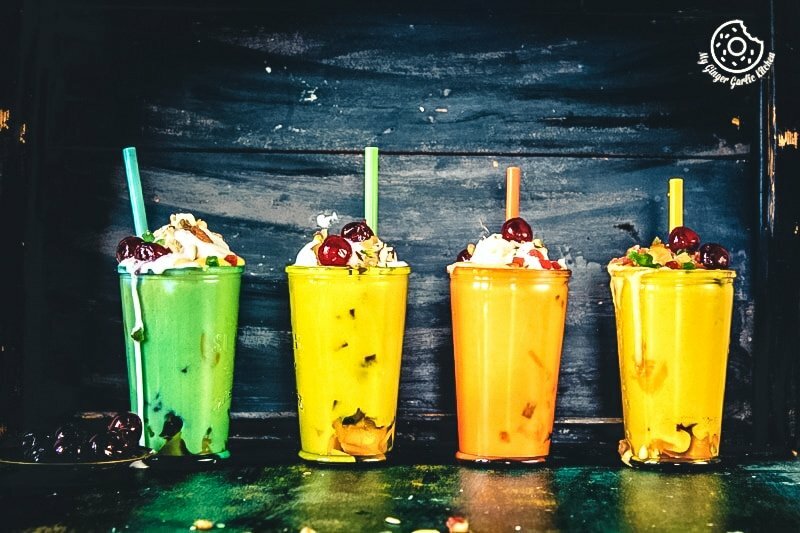 You would love this drink if you love mangoes, or milkshakes, or mango milkshakes. This would make a great and filler breakfast milkshake because it is quite heavy and thick. Always use chilled mangoes and chilled milk for making this drink. You can use skim milk for making mango mastani, but I would recommend full cream milk or at least 1.5% fat milk because it tastes richer and delicious. Some people don’t like to add vanilla ice cream to this milkshake. So if you don’t want to add ice cream you can still make it richer by adding whipped cream. I added some sugar to this milkshake, but if your mangoes are too sweet then you can omit sugar completely or reduce its amount to your liking. You can also add few drops of rose water or kewra water to this milkshake. You can replace vanilla ice cream with pistachio ice cream. 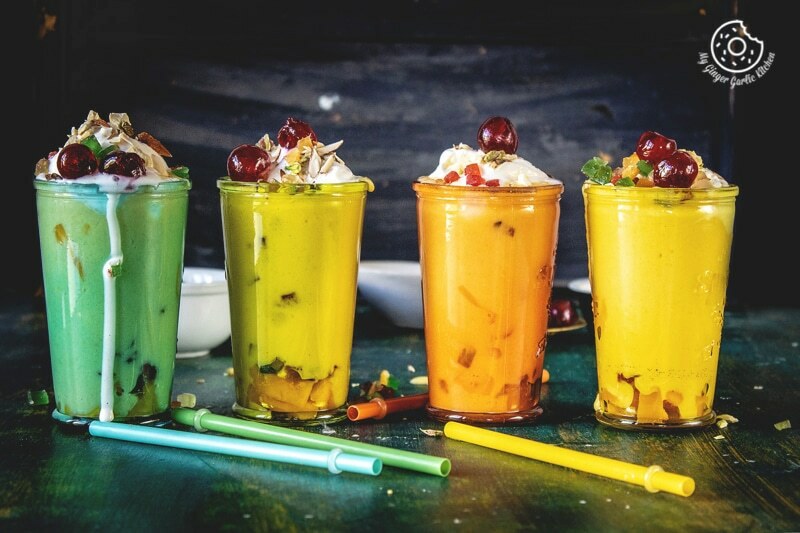 Mango Mastani is a rich and thick mango milkshake topped with vanilla ice cream, chopped nuts, and tutti frutti or Sweet Candied Fruit. This is a fabulously decadent & gorgeous mango milkshake, which is named after the famous Bajirao’s Mastani. 1. In a blender add chopped 3 cups mangoes, 1.5 cups vanilla ice creams, chilled milk, sugar and blend well until smooth. 2. Divide chopped mangoes into 4 serving glasses. 3. Pour the mango milkshake into glasses and fill the glasses 3/4th, or till you have some space at the top for ice cream scoops. 4. Add 2 scoops of vanilla ice cream in each glass. 5. Sprinkle with tutti frutti, chopped almonds, chopped pistachios, chopped cashews, and glazed cherries. 6. Serve mango mastani immediately with a straw and a spoon.